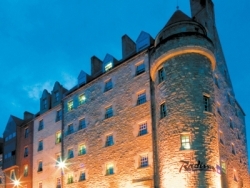 In Edinburgh, we'll be staying for 3 nights at the Radisson Blu Royal Mile Hotel. With its turrets and 16th-century exterior, the hotel fits perfectly the historic Royal Mile in the heart of Edinburgh. 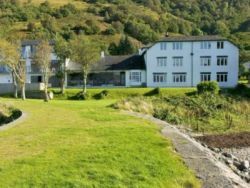 The hotel's amenities include the chic Itchycoo Bar and Kitchen serving a varied, seasonal menu, and a spacious restaurant offering traditional Scottish breakfasts. There is also a modern fitness center with a heated swimming pool, sauna and fully equipped fitness suite. The 238 stylish guest rooms feature first-class amenities, such as plush bedding, laptop-size safe and mini bar, individual climate control, a spacious work area, free high-speed Wi-Fi Internet, tea and coffee making facilities, digital TV and 24-hour room service. The rooms' chic, modern design of soothing soft white and dove-grey is highlighted by black-and-white photographs of the city. Each sleek, modern bathroom is stocked with upscale amenities such as hair dryers, bathrobes and Anne Semonin toiletries. 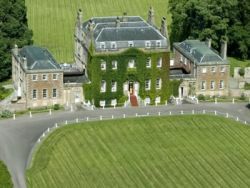 In Inverness, we'll be staying for 3 nights at the Culloden House Hotel. This elegant Georgian country house turned award-winning hotel sits on 40 acres of beautiful private grounds, once the lodging of Bonnie Prince Charlie during the Jacobite uprising of 1745 and now located close to such attractions as championship golf courses and National Trust treasures. Culloden House offers croquet on the lawn as well as a tennis court, sauna, four-acre walled garden, forest trails, and a sophisticated fine-dining restaurant with modern Scottish cuisine featuring fresh local produce. The 28 elegant en suite rooms are lavishly furnished with wooden furniture and luxurious bedding, boasting romantic luxury and modern comforts such as digital TVs, trouser presses, hairdryers, and free Wi-Fi in addition to a turndown service and newspapers and magazines available in every room. In Kentallen, in Scotland's Western Highlands, we’ll be staying for 2 nights at the Hollytree Hotel, on Loch Linnhe in the Glencoe area. Built as the Kentallen Railway Station in the 1890s, it has been meticulously restored into a luxury hotel with one of the best water edge locations in Scotland. The public areas of the hotel include an award winning Seafood Restaurant and the Captain’s Lounge Bar with Outside Drinks Terrace. There is also a fully heated indoor swimming pool and a Finnish sauna to pamper the guests. All of the 20 bedrooms have private bathrooms, separate seating areas, most have balconies and all have fantastic sea views. The bedrooms are furnished with modern and chic furnishings for the ultimate comfort. They have free Wi-Fi, TV with DVD player, hairdryer, telephone, radio alarm clock, complimentary tea, coffee, hot chocolate and biscuits and a selection of good books and DVDs. A selection of fine toiletries and fluffy towels are provided for the guests’ comfort. 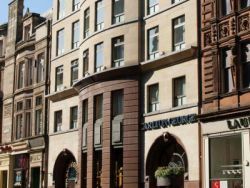 At the conclusion of the tour, we'll spend two nights in Scotland at the Carlton George Hotel in Glasgow. Ideally located in the leisure area of central Glasgow near City Chambers, the Gallery of Modern Art, Glasgow Green, and the famous shops of Buchanan Street, this boutique hotel features modern furnishings, free Wi-Fi, laundry service, garden area, a rooftop restaurant serving a creative modern menu with fine Scottish produce, and an upscale bar offering 6 unique bars set over 3 floors and joined by a maze of passageways. Each of the 64 stylishly-decorated rooms features comfortable furniture, a complimentary mini-bar, in-room safe, LCD satellite TV, ironing facilities, tea and coffee-making facilities, radio alarm clock, a separate sitting area, and bathroom with a bathub and a shower, hairdryer, luxury toiletries and terry bathrobes.